Level 8 Craftling: The Kittens are Home! Yeah, you read that right. I brought home two kittens, not one. First I found out that I was the only confirmed person taking kittens out of the litter of five. Then my friend Paul heckled me about being careful or I'll bring two of them home. After some thought, I did an internet search of two kittens vs 1 kitten, and overwhelmingly the answer was always get two kittens if you can, because they will keep each other more entertained and happy, and therefore will be better behaved - less likely to tear the furniture up from boredom or meow all the time when you're not home and annoy your neighbors, etc. So I decided to go for it! And the vet agreed when I took them to the vet yesterday, saying that she always recommends two kittens (though only one dog at a time). Here they are! Gnome (pronounced "genome") is a girl, and she's a tabby with orange markings (her nose is orange!). Kobold is our little elfin black cat - his face is too narrow for his ears, so he looks kind of fey. They were really calm in the car ride! We had a 2.5 hour ride home from Ionia, where we picked them up, and they spent a lot of it sleeping and were really quiet. Gnome spent most of the ride (when she wasn't zonked out) with her nose up against the window. I had picked her up a couple times to see outside, and then she kept rearing up to look out the window herself. After some exploring, she found the triangle window up at the back of the car and laid there for the rest of the trip right behind my shoulder. Kobold didn't care about the window. He just curled up on the seat and stayed there. Here are the wee ones curled up on the papasan! I interrupted their nap taking a photo, oops. They went right back to sleep, though. So, we didn't get home until 11 pm the night I got them, and then they thought it was highly exciting exploring the entire house. I didn't get to bed until after midnight sometime, and then they decided that 1:45 am was the perfect time to start jumping around and attacking my feet. After putting them off the bed twice and having them jump right back up and attack me again, they got put into the living room for the night. It's really nice having two of them - I don't have to worry about them being lonely if I kick them out of bed, as they have each other. 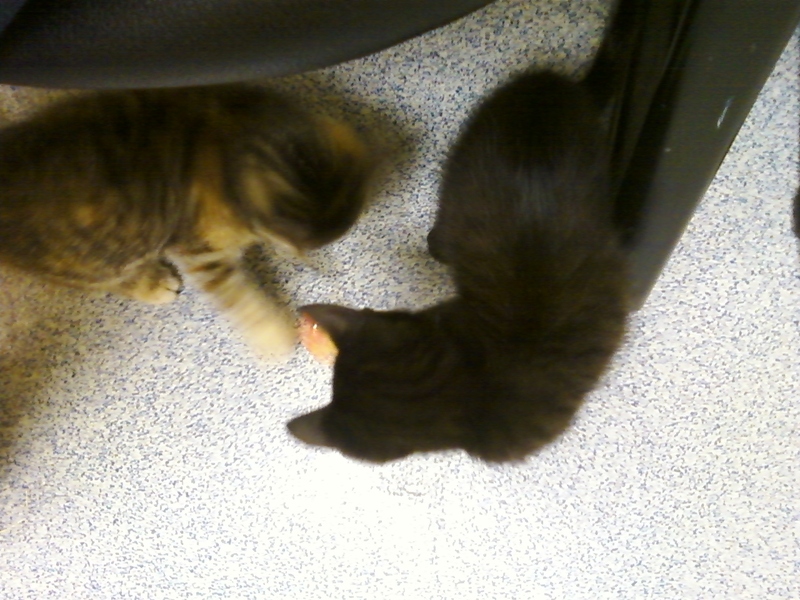 And boy, are they adorable, watching them run around and pounce on one another. 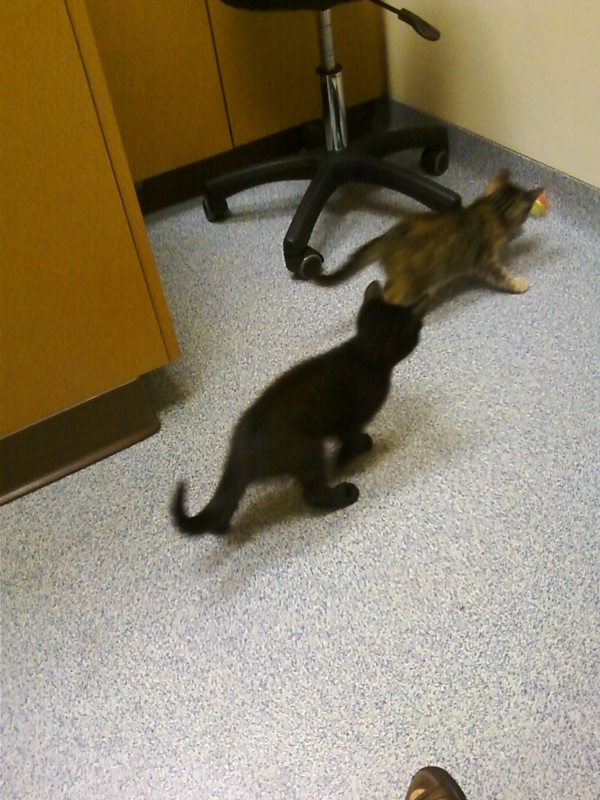 And then we went to the vet yesterday afternoon! 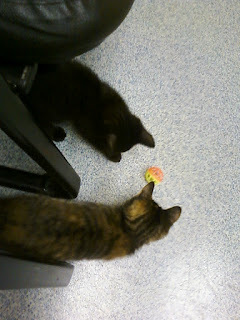 They weren't happy about the shots, but they got two little toys and had a great time batting them around the room for 20 minutes as we waited on test results. 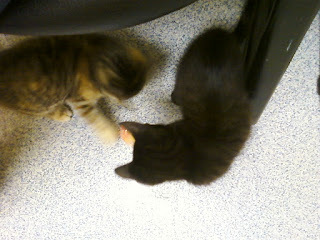 They don't have leukemia, which is awesome, though they do have fleas. The anti-flea medicine should kill them shortly, though. Thankfully, they slept much better last night. They were quiet from 10 pm until 7 am! I accidentally rolled over onto them with my shoulder once, oops. 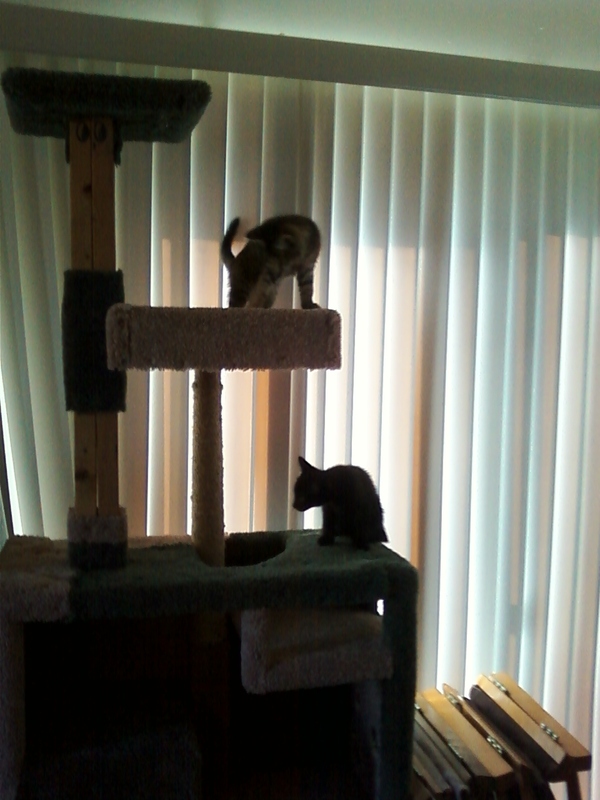 This morning as I was eating breakfast I looked over and they were on the cat tower! I think I gasped, because DeForest looked up at me and I just pointed. Yay! Gnome managed to leap up onto the box level! Then she wasn't sure how to get down for quite a while, haha. 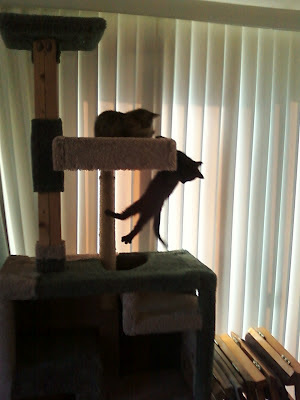 She turned in circles for a while, chasing her tail, in between trying to figure out how to get down. Kobold tried to join her and failed! I'm so glad I was holding my camera at the time, because he hung there for a few seconds and it was really funny. They are so cute. They haven't quite figured out how to get between all the levels - mostly, they appear to climb the outside of the tower to the top part and kind of dart in and out that top level, along with spending some time going in and out of the very bottom level. They'll figure out they can fit up the ramp soon enough, I'm sure. 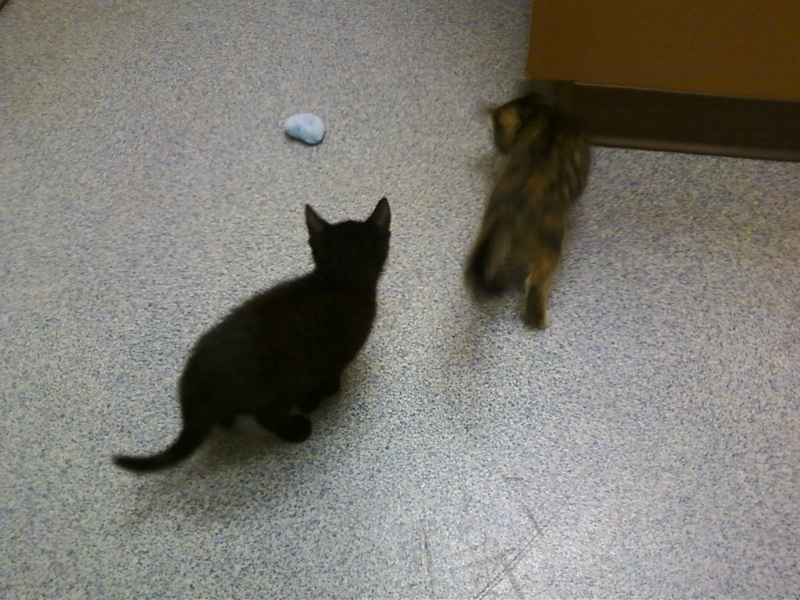 Yay, kittens!